Other images in the film seem designed to highlight the indexical referents of its construction, delineated in the book as “Exhibits #1 through #97” (Eugenides 246). Shostak goes on to identify another of the film’s visual motifs, “in which a static camera holds a long shot of the front of the Lisbon house for several beats” (Shostak 192). For Shostak, the primary function of these shots is to align the audience with the neighboring boys, watching the Lisbons from across the street. While I agree that this is part of Coppola’s intent, I believe that this effect is further tied in with a desire to visually foreground the objects by which the boys have come to define the Lisbon girls, the sisters themselves representing the missing puzzle piece whose lack is suggested by what surrounds it. The stasis and distance cited by Shostak as the motif’s defining visual characteristics recall those of a photograph, and it is worth noting that despite the boys’ collection of souvenirs having been initiated by the acquisition of Cecilia’s diary, it is a polaroid, “taken by a real estate agent, Ms. Carmina D’Angelo,” which in Eugenides’s novel is designated “Exhibit #1” (Eugenides 5). The primacy of this “exhibit” in the text, and the frequency with which the narrator refers back to it, attest to its significance, a valence which is similarly enacted in the film through the repetition of the visual motif identified by Shostak. Perhaps the most striking shot of the Lisbon house is the time lapse which occurs an hour and fourteen minutes into the film. Succeeding a series of shots which depict the removal of several neighborhood trees, the Lisbon house stands in stubborn defiance of the decay within and surrounding it, its own diseased elm temporarily saved by the four remaining sisters’ protests. Occupying only twenty five seconds of discourse time, the story time is of indeterminate length, seemingly depicting an entire season’s change over the course of a single evening. As shadows stretch across the lawn and the sky darkens, leaves start to accumulate across the Lisbons’ property. By dawn, the entire lawn is covered, and an entire autumn is compressed into a single twenty-four hour span. 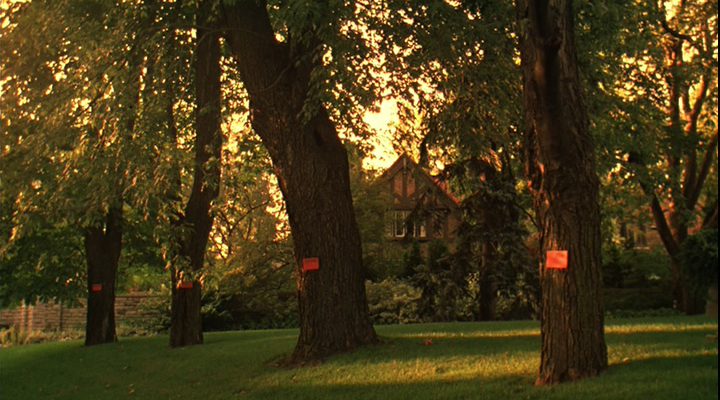 In its poetic depiction of an impossible chronology, this one extraordinary shot exemplifies The Virgin Suicides’s multivalent temporal signifiers, expanding and complicating them beyond the past-present duality inherent in any film featuring retroactive voiceover narration. The visible elisions, made apparent by the conspicuously choppy time lapse, remind the viewer of the disconnectedness of the images and, by extension, the discourse; like the impressionism alluded to Cecilia’s diary, the film is comprised of autonomous moments which create the illusion of a continuity despite their gaps. 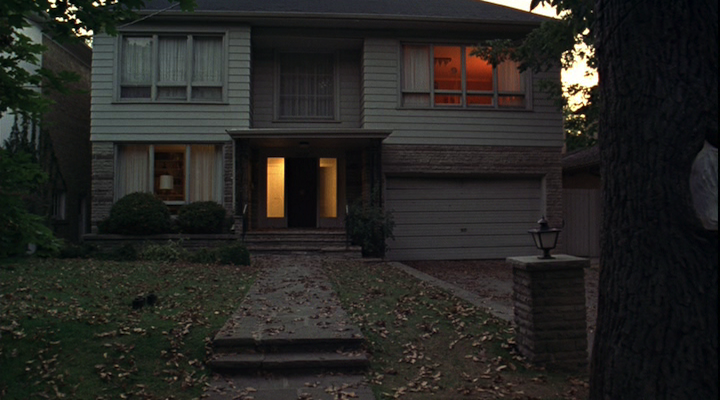 In addition to these and other extended shots of the house, Coppola and Lachman often frame shots in a manner which foregrounds or isolates objects which function as signifiers of the Lisbons. 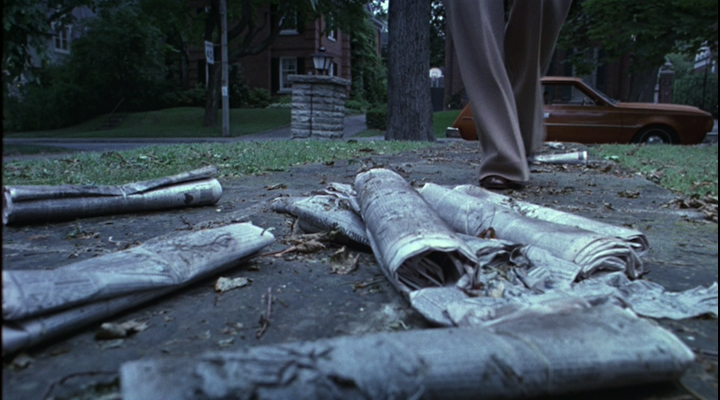 The arrival of a local television reporter at the Lisbons’ home, for instance, is shot at a low angle which reduces the reporter to a secondary figure, instead foregrounding the unread newspapers accumulating upon their front porch which function as a shorthand for the increasingly isolated Lisbons. Lingering shots of objects belonging to the Lisbons not only visually imply the narrator’s curatorial project, but their kinetic stasis both accentuates the felt lack of the Lisbon sister as well as recalls the aesthetics of still photography. Elsewhere in the film, as she does when she introduces the sisters one by one, Coppola temporarily freezes the image track, as though the narrator were trying to pluck and preserve ephemeral moments; that she always reanimates the image suggests the impossibility of doing so. 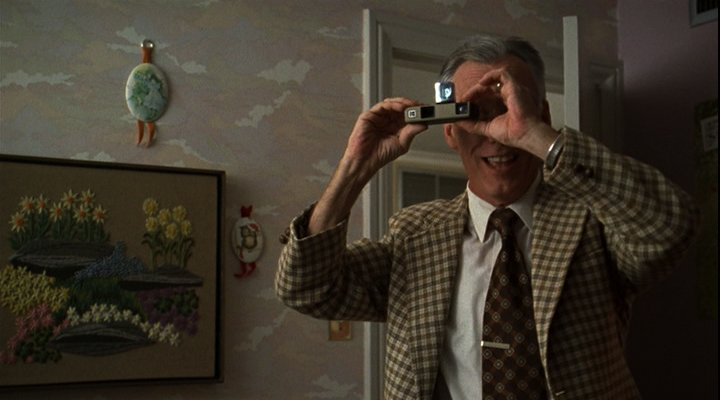 When the sisters are preparing for the homecoming dance, Mr. Lisbon enters the room with a camera to take their picture; as he does so, Coppola again freezes and reanimates the image. By aligning this instance of the freeze frame with the act of photography (and specifically with a photograph which the novel tells us exists in the boys’ collection as Exhibit #10) Coppola suggests that these still images are among the indexical referents from which the narrator has invoked the surrounding action (Eugenides 18). In other words, the freeze frames are not extracted from the moving image, but are the seeds from which the image track has sprouted. In another sequence, Peter Sissen (Chris Hale) smells a tube of lipstick he has found in the Lisbons’ bathroom. As in the diary sequence, the picture dissolves to an idealized image of Lux bathed in aureate sunlight, smiling directly into the camera; Air’s extra-diegetic score swells on the audio track. Objects, like photographs, thus have a totemic power to both spur the boys’ imaginations and to birth the heterogenous cinematic form. Another way in which Coppola suggests an indexical referent that remains partially obscured to the audience is in her treatment of extra-diegetic music. Unlike the score by Air, which eases in and out of the audio track smoothly and with no aural anomalies or “surface noise,” whenever a pop or rock song from the era in which the film is set plays on the soundtrack, it is preceded by the sound of a turntable cartridge making contact with a vinyl record; additionally, the scratches and pops common to the vinyl format are audible throughout the duration of the music. This needle-drop approach to the film’s song track foregrounds the music’s physical form as a 33 or 45rpm vinyl record, suggesting each song’s concrete existence outside of the discourse as a tangible object within the boys’ “collection of souvenirs.” As the needle drops and a song begins, it is as though the narrator has placed a record on the turntable and is playing it for the audience in an illustrative context, just as he/they may display a photograph or read a quotation. Over a summary of Trip Fontaine’s sexual prowess, for instance, depicted visually by a montage of pseudo-iterative shots (Trip floating in a pool, Trip welcoming a female classmate into his house, Trip flirting with the school secretary), the song “Magic Man” by Heart conveys more immediately and vividly Trip’s je ne sais quoi than a traditional voice over would be able to. There is a precedent for this interpretation of the songs as a form of narrative shorthand to be found within the diegesis, specifically in a sequence late in the film wherein the boys and the Lisbon sisters play songs to each other over the phone. After Mrs. Lisbon confines her daughters to their house, the boys look them up in the telephone book and call them; when the girls answer the phone, the boys play them Todd Rundgren’s “Hello, It’s Me,” initiating a back and forth in which the girls express their isolation through Gilbert O’Sullivan’s “Alone, Again,” the boys enlist the Bee Gees to urge the girls to “Run to Me,” and the girls finally resign themselves to being “So Far Away,” with help from Carol King. Coppola uses a horizontal split screen to unite the boys and the girls on screen within their shared temporal moment, even as the bifurcation of the image stresses their physical remoteness; she frames the girls tighter than she does the boys, as though there’s only a finite range of information which can fit through a telephone line. 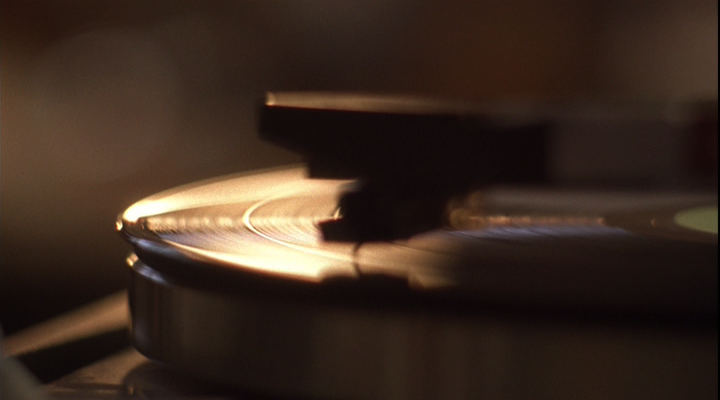 There are also several closeups of the turntable cartridge gliding across the spinning vinyl, visually anchoring the aural signifiers heard on the soundtrack throughout the course of the film. By stressing not only the music but its physical medium, the film underscores the fixity of its temporal duration and gives greater valence to the audio track. Thus, it follows that the image can be considered subordinate to the soundtrack in general, just as it is thought to be conjured by the narrator’s telling of the tale. On a surface level, there is a direct association of the five sisters in general, and of Cecilia in particular, with the suffering elm trees in their neighborhood. Cecilia presses her palm print into their elm tree, is depicted amidst its branches, and writes extensively in her diary about their slow death by Dutch elm disease. The girls and the elms are both things of natural beauty cut down (one literally, the other figuratively) prematurely. It’s a pat and thoroughly obvious corollary which is even called out in the text of the novel for its lack of imagination (“[M]any people in our neighborhood found it easy to imagine why the girls might connect the elm with Cecilia. ‘They weren’t saving it,’ said Mrs. Scheer. ‘They were saving her memory’”) (Eugenides 182). This history of and the conditions which exacerbate Dutch elm disease, however, are worth mentioning, as they point to a deeper level of signification within the narrative. On their website, the American Phytopathological Society states that, “The first North American Dutch elm disease epidemic began when Ophiostoma ulmi was introduced in the 1920s by furniture makers who imported European elm logs to make veneer for cabinets and tables” (D’Arcy). As suburban neighborhoods flourished following the war, elms were planted in rows along domestic roads; their leafy branches made effective windbreaks, and afforded an ideal mix of sun and shade. This trend, though aesthetically desirable, inadvertently made the trees susceptible to outbreaks of Dutch elm disease, which can spread either through the migration of elm bark beetles carrying the fungus or through grafting of the root structures of trees planted in unnaturally close proximity. As Christian Long explains, “the natural tendency of elms to grow far apart usually prevents the spread of such blights,” but as “suburban developments lined their streets with elms planted in every house’s front yard, spacing the trees perhaps one hundred feet apart…. The proximity of suburban elms enabled and accelerated the spread of the blight” (Long 357). When Trip convinces Mr. Lisbon to let him take Lux to the homecoming dance by suggesting that three of his friends take the other three sisters, the girls, though excited, bemoan their seeming interchangeability in the eyes of both their father and of the boys, remarking that they will likely “raffle us off” to determine who will be paired with whom. The narrator further stresses their interchangeability when he later informs the audience that Mrs. Lisbon added several inches to the bust and hem of each girl’s dress, rendering them all as “four identical sacks.” “We had never known her,” the narrator confides in the novel upon finding Bonnie’s body, hanging from the basement rafters; “They had brought us here to find that out” (Eugenides 215). It is only in their deaths that the girls are able to assert themselves as individuals to the boys and to the community: the one who tried to slit her wrists and ultimately jumped off the roof, the one who hanged herself, the one who stuck her head in the oven, the one who filled herself with booze and sleeping pills, the one who asphyxiated herself in the garage. 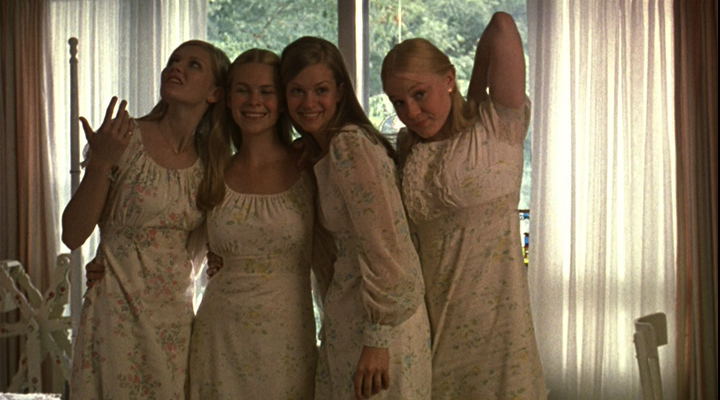 Coppola omits much of the racial and socio-economic subtext which is present in the novel in order to focus more acutely on the nostalgic tone created by the narrator’s impressionistic account of the girls. Issues of race, for instance, which in the novel involve shop owners’ concerns about the increasing black presence in town as white families are displaced by the taint of both the suicides and the Dutch elm outbreak, are left out of the film entirely. Industry’s creation and corruption of a false idyll in the form of manufactured suburbia, however, is retained, if only obliquely. Bonnie, protesting the removal of their elm, insists that the outbreak could have been avoided “if boats didn’t bring the fungus over from Europe in the first place,” alluding to the infestation as stemming from commercial and industrial pursuits. 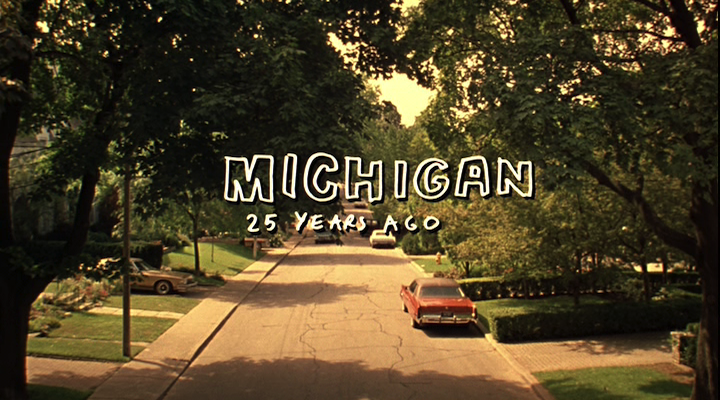 By maintaining the novel’s geographic and temporal setting of the Detroit suburb of Grosse Pointe, Michigan in the mid 1970s, and by including a mention of “the city’s declining auto industry” in the voiceover narration, Coppola reinforces this notion of suburban decline as an infection emanating from centers of industrial production. In the words of Christian Long, “The suburban built environment generates its own destruction, either through complicity in the large-scale deforestation caused by Dutch elm or in its unsustainability in the face of the economic pinch of the oil embargo and energy crisis” (Long 362). In writing about The Virgin Suicides, Keith Wilhite draws attention to several references Eugenides makes to WWII throughout the novel. He goes on to discuss the military-industrial complex and to detail the manner in which the American government, following the second World War, fostered suburban sprawl, setting up programs such us the Federal Housing Administration and the GI Bill to encourage middle class domesticity and, later, used the threat of nuclear warfare to further sell the idea of the home as haven through the marketing of basement bomb shelters. Wilhite concludes that “international warfare gave way to a tacit and protracted domestic war against America’s urban centers, creating the residential segregation and social conditions we see in The Virgin Suicides” (Wilhite 8). While I do not wish to delve deeply into Wilhite’s claims, I do feel they are worth mentioning since Coppola, despite omitting the novel’s specific references to WWII, sneaks in one of her own. 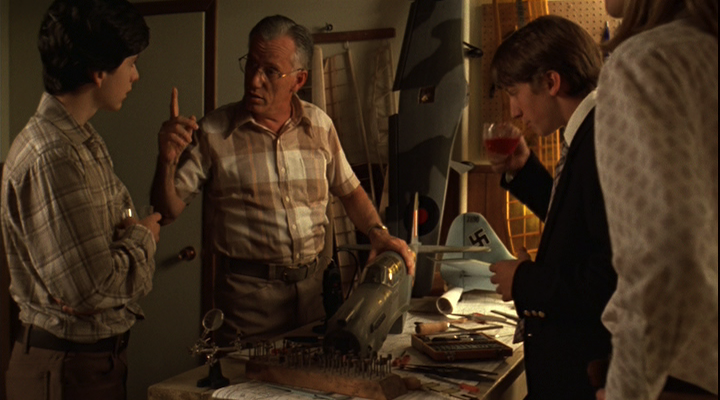 In the novel, when the neighborhood boys are invited to the Lisbons’ house for a party, Mr. Lisbon is said to be boring them by showing off his tool collection; in the film, however, Coppola replaces Mr. Lisbon’s tools with a collection of models of WWII aircrafts, thus allowing for this potential reading of the film.